“I remember thinking, it’s not this guy’s day to die,” said Russell Bowman, a KCU alum from the class of 1989, as he was briefed before boarding the helicopter to airlift a victim from the Coast Guard cutter Mustang to the hospital in Sitka, Alaska. The harrowing story, which was rivetingly recounted by Jon Mooallem in the New York Times Magazine last month, is a tale of three young men on a kayaking adventure on a remote island in Alaska’s Glacier National Park. While hiking after a torrential downpour, Mooallem’s friend Jon Cohrs is hit by an 80-foot tree that fell when its roots suddenly gave way from the sodden forest loam. 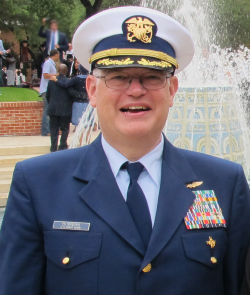 Bowman, currently a Senior Medical Officer for the Coast Guard in Juneau, was at the base in Sitka on that August day in 2002, and he ran through all the things that had serendipitously occurred, a series of coincidences which had allowed Cohrs to be rescued in the first place. “The guys had a radio, which was good, and they were able to reach that Coast Guard cutter, which happened to be within range because of the bad weather, and then the weather stabilized just enough for us to reach him,” Bowman said. “It all came together perfectly to get him out of there,” Bowman said. Normally Bowman would treat patients at the base, and only fly on a helicopter rescue if the call sounded like it was going to be something significant. “This sounded significant,” recalled Bowman. 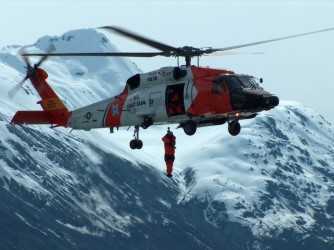 The Coast Guard had evacuated Cohrs from the island to the cutter, and when the helicopter arrived Bowman was lowered onto the deck of the moving ship. “It’s funny, because I hate roller coasters, but being hoisted is not that big a deal for some reason,” Bowman said. Mooallem described Bowman’s arrival on the scene in almost superhero terms, feet planted wide across the threshold, a “silhouette of a man in a blue flight suit.” As Bowman examined Cohrs, he began to doubt his initial optimism. “He had the mechanisms to be really sick, with severe internal injuries,” said Bowman. “I knew we had to get him to the surgeon as quickly as possible.” Bowman administered painkillers and minutes later Cohrs, strapped into a basket, was hoisted up to the helicopter. Bowman followed. Thanks to the medical team at the hospital in Sitka, despite a crushed spleen, numerous broken ribs, two punctured lungs and other major injuries, Cohrs made it through. Bowman, now a seasoned veteran of Alaska’s forbidding conditions, thought back to that afternoon 17 years ago.